A 2012 Appalachian Voices’ report mapped the findings of peer-reviewed health studies and data from the U.S. Center for Disease Control, United Health Foundation and the Gallup-Healthways Well-being index. The federal Office of Surface Mining Reclamation and Enforcement (OSMRE) announced today that it will fund a $1 million review by the National Academy of Sciences of current research on the links between surface coal mining and human health risks. 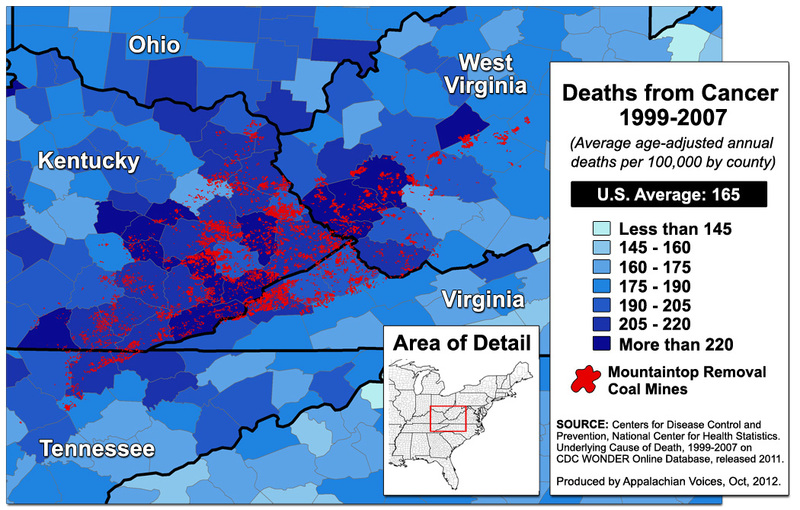 It comes more than a year after the West Virginia Department of Environmental Protection formally requested such a review, and nearly a decade after the publication of the first in a series of two dozen peer-reviewed studies that have found correlations between mountaintop removal coal mining and increased rates of cancer, heart and respiratory diseases, and other negative health outcomes. 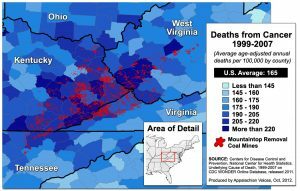 In recent years, multiple studies have established more direct, causal links between mountaintop removal and negative health impacts. Studies led by researchers at West Virginia University have concluded that exposure to mountaintop mining dust promotes tumor growth in human lung cells and decreases cardiac functioning in lab animals. Research from outside the region show cause for concern regarding common mining pollutants such as manganese. Several studies1 over two decades have demonstrated a link between nervous system damage in children and manganese exposure through well water. OSMRE will share additional information as it becomes available, including the dates of four public meetings to be held by the National Academy of Sciences. “We’re pleased that OSMRE has listened to the concerns coal-impacted residents have been voicing for years. And, while we always welcome additional research into the toll mountaintop removal takes on human health and the environment, action must be taken on the preponderance of existing evidence showing the known impacts of surface mining. If we value the lives of Central Appalachian citizens over coal profits, mine permitting would be halted until it could be proven safe for nearby residents. “We are still awaiting a long-overdue Stream Protection Rule and are hopeful that a strong rule will be issued soon by the Obama administration. There is more than enough scientific research documenting the impacts of mountaintop removal on Central Appalachia’s streams and rivers to justify a moratorium on mining through streams, which irreparably harms aquatic ecosystems and likely contributes to a range of human health issues. 1 – Bouchard, M.F., Sauve, S., Barbeau, B., Legrand, M., Brodeur, M.E., Bouffard, T., Limoges, E. Bellinger, D.C., Margler, D. 2011. Intellectual Impairment in School-Age Children Exposed to Manganese from Drinking Water. Environmental Health Perspectives Jan;119(1):138-43. Hafeman, D., Factor-Litvak, P., Cheng, Z., van Geen, A., Ahsan, H. 2007. Association Between Manganese Exposure Through Drinking Water and Infant Mortality in Bangladesh. Hafeman, D. et al. Environmental Health Perspectives Jul;115(7):1107-12. Woolf, A., Wright, R., Amarasiriwardena, C., Bellinger, D. 2002. Child with Chronic Manganese Exposure from Drinking Water. 2002. Woolf, A. et al. Environmental Health Perspectives Jun;110(6):613-6. Wasserman, G.A., Liu, X., Parvez, F. Ahsan, H., Levy, D., Factor-Litvak, P., Kline, J., van Geen, A., Slavkovich, V., Lolacono, N.J., Cheng, Z., Zheng, Y. Graziano, J.H. 2006. Water Manganese Exposure and Children’s Intellectual Function in Arailhazar, Bangladesh. Environmental Health Perspectives Jan;114(1):124-9.